I’m a coffee drinker. My preference is for a Nespresso at home, but circumstances sometimes dictate that I get a coffee from a nearby chain. I’m not wedded to any particular brand, and I usually have several different loyalty cards on the go at any one time. These coffee chains have become a favoured meeting point for many, and their customers cover just about every imaginable demographic and age-range. With the attraction of WiFi provided at no cost, it is not uncommon to find customers doing their emails, browsing the web or keeping updated via social networks whilst enjoying a coffee. And this is not an accident – the chains have actively set out to promote this. Chains such as Starbucks, Costa Coffee and Caffe Nero have recognised that they can charge for more than just the coffee; after all, their customers are looking for an experience. Starbucks, for example, talk of being the third place, between work and home and are quite clear that they’re “so much more than what we brew“. That’s a fair point, but some customers just want the coffee to take out and don’t want to spend the next hour in the shop. The coffee is sourced centrally (probably by Head Office). Its quality varies little, and its taste is carefully selected to appeal to the target customers. The experience may be defined centrally but it is delivered locally, and as such, it can vary tremendously. It is heavily dependent on staff – real people. Wherever we look, we’ve become familiar with corporate directives which define everything about a customer experience. From defining the specific words to be used when answering the phone, to the greeting used by checkout staff; from the way in which items are displayed at point of sale, to the positioning of signs – little is left to chance or to the initiative of the sales staff in the quest for “a consistently great customer experience”. My recent visit to a coffee shop confirmed what I’ve seen before. In this instance I was in a Starbucks but this criticism is not directed solely at them – I’ve seen the exact same thing in other chains. Place order for take-out double espresso. 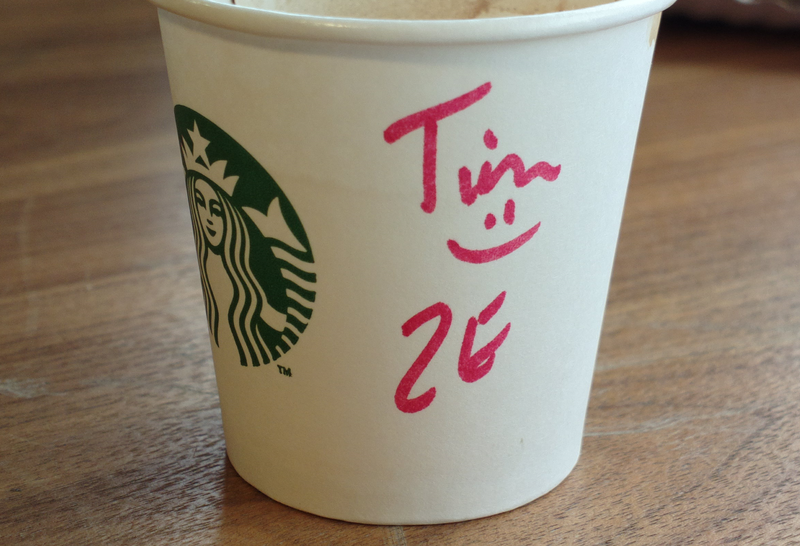 Provide name to Staff member #1, who writes it on a cup. Move one step forward. Staff member #3 makes double espresso. Move one step forward. Staff member #4 passes me the double espresso. Exit the shop. Is this the way the “experience” was designed by Head Office? This really was an production line in action. I felt like a car travelling along an assembly line, while the engine is fitted, followed by wheels, interior trim, doors etc. Efficient? Maybe. Enjoyable? Personal? Absolutely not. How refreshing and personal it would have felt had I been greeted by someone who took my order and my money, made my coffee and handed it to me – while the other members of staff did the same for the other customers. The irony was that at step 4, the member of staff announced “Double espresso for Tim“, introducing a pseudo personal element to the process. The cup might just as well have said “Next” on it. The next time I see this process in operation, I might just quote “Next” as my name and see how that works :-). What do you think? Please comment below. And feel free to subscribe to this blog. This entry was posted in Marketing, Process, Product management, Users and tagged coffee, consumer experience, experience, process, Starbucks by greatproductmanagement. Bookmark the permalink. I don’t actually too mind the production line type process too much in a coffee shop, as long as each person offers a reasonably sincere human element to it along the way. What annoys me (and this applies not only to coffee shops, but to places like Subway, and any food/drink places like that where there are potentially several options at different stages and you have to know how it works in order to smoothly go through their production line), it’s when the staff show signs of irritability if you don’t understand the choices you are expected to make. They’ll throw questions at you, but if you’re not familiar with it, you won’t necessarily know what the choices are, and I’ve often witnessed mild irritation in staff if the customers don’t right away understand what they are being asked, or what the options are that they have to choose from. I do understand that it’s a tricky balance, because equally, as a customer it would be irritating to have everything explained in detail if you are already familiar with it! But I think it’s a balance that they need to find if they want the customer to feel comfortable with the experience. Sorry about the typo in my first line, with the stray “too” thrown in there! No worries – that happens to me too! You’re absolutely right, Vanessa. That sort of behaviour from staff isn’t good – they can make customers feel at best “unqualified” by the way in which they are tutted along the line. And it is sometimes extremely confusing. But yes, it’s a tricky balance which can’t be easy to get right. I had a great experience last week in Caffe Nero – the coffee was certainly good, but actually it’s the overall experience which was great, and most memorable. The (single member of) staff was helpful, friendly and most definitely part of the whole offering. I’ll be back there before long.